The suit or tuxedo a man wears can say a lot about his personality. Is he bold and adventurous? Or does he lean towards tradition and simplicity? No matter the manner in which you choose to present yourself, your formal wear should always maintain impeccable style without sacrificing fit or function. Savvi Black Label is trusted by countless men to provide unique formal looks that men with a wide range of tastes love, always crafted from top quality materials that ensure longevity and a flattering silhouette. 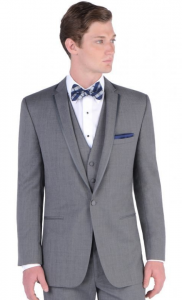 In this designer spotlight, we’ll explore the variety of signature mens designer suits and designer tuxedos from Savvi Black Label available from Savvi Formalwear that will have you looking like the dapper gentleman you are at your next special event. First, we’ll start with the basics. A classic black suit or tuxedo is a must-have for every man. It is a formal wear staple that offers a simple elegance that flatters men of all ages and body types. 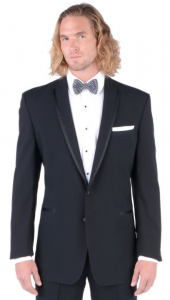 Savvi Black Label had modernized the classic black tux with the Black Kristoff. The slim fit jacket hugs close to the body, creating a sleek, clean line that is fresh and flattering. The lightweight comfort wool jacket has been designed for complete comfort, featuring a single button front closure, side vented back, and framed notch lapel, so you can boogie all night at your wedding or other special event without breaking a sweat. This luxurious tux is completed with a pair of matching black flat front pants for q slick look that avoids the frumpy mess many men tend to fall into with their formal wear. For tin a touch of subtle flare, this signature Savvi Black Label look features a satin trim on the lapels and besom pockets. While you certainly can’t go wrong with a classic black suit or tux, Savvi Black Label encourages to step out of the box with lighter alternatives in the collection. A grey suit or tuxedo is the perfect choice for any man who wants a fresh, eye-catching look, while still maintaining the simple elegance that a black look offers. Both the Grey Valencia and Grey Kristoff are staples of the Savvi Black Label collection, each a classy and unique option in this lighter color. The Grey Valencia takes your average dowdy grey suit and modernizes is for today’s style-conscious man. With a slim fit jacket that fits close to the body, pick stitch notch lapels, and besom pockets, the lightweight comfort wool jacket hits your body in all the right places. The jacket is paired with sleek flat front pants that continue the clean lines of the jacket. Another equally as stylish option, the Grey Kristoff also features a slim fit jacket and matching flat front pants. The Grey Kristoff ups the elegance a notch with a satin-trimmed notch lapel that will subtly catch the light and provide a touch of sheen. Both the Grey Valencia and Grey Kristoff can be paired with a matching grey vest. A full departure from the simple black or grey suit or tuxedo is the white suit or tux. White suits are for men who are adventurous and have no problem when all eyes are on them. Savvi Black Label specializes in bold, white looks that fit and flatter. In the Savvi Black Label collection there are a variety of white looks to choose from, including the White Spectre, Ivory Kristoff, andWhite Casablanca. 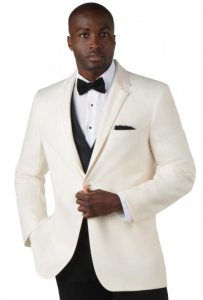 The White Spectre tux by Savvi Black Label screams “James Bond,” with one of the freshest looks out there. What sets the slim fit, one button closure jacket apart is the stunning black satin framed shawl lapel that is both bold and classy. This coordinates seamlessly with the satin besom pockets. Complete the look with a pair of simple black flat front pants that pick up on the black lapel to help it pop. For a simpler take on the white suit, consider the White Casablanca from Savvi Black Label. A striking formal look, the White Casablanca features an all-white modern fit jacket crafted from comfort blend fabrication, with a one button front closure, flap pockets, center vented back, and shawl lapel. Pair the jacket with matching white pants, or switch things up with coordinating black flat front pants. Do you like the lighter color a white suit offers, but want something a bit softer? Savvi Black Label has you covered with the Ivory Kristoff. Offering the same slim and sleek silhouette of the Grey Kristoff, the Ivory Kristoff is a rich and creamy version that is just as dapper. Perfect for a warm weather or winter wedding, the Ivory Kristoff is flattering on men of all skin tones, and looks stunning when paired with a black vest and coordinating black flat front pants. Savvi Black Label is not afraid to “go there” with unconventional looks that have men turning heads left and right. On the list of bold and out of the box yet totally sleek and elegant looks is the brown stunner, Cocoa Kristoff. 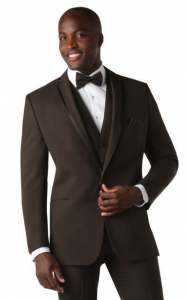 While many men may stay away from brown suits or tuxedos for fear of looking drab, the Cocoa Kristoff is ultra-sleek and stylish, having been updated to fit the modern man. With a slim fit, comfort wool jacket with one button front closure and side vented back, your body will look slick and trim. Framed notch lapel an besom pockets create nice, clean lines against your body, avoiding the frumpiness that many jackets are guilty of. Finish off the Cocoa Kristoff with a pair of deliciously sleek matching flat front pockets. Savvi Black Label has been styling men of all ages for years, creating fresh and bold suits and tuxedos that make suit or tux shopping fun again. Explore the collection of Savvi Black label tuxedos and Savvi Black Label suits exclusively available from Savvi Formalwear to find your next unforgettable formal look.